AXYZ, a leading global manufacturer of CNC router systems and CNC knife systems based in Burlington, Ontario, announces the acquisition of WARDJet, a Tallmadge, Ohio firm that manufactures waterjet cutting machines and offers custom waterjet solutions to a variety of industries. AXYZ President, Alf Zeuner, who will oversee the combined company as president, says, “AXYZ believes in providing localized sales and service support through our own offices. This ensures fast and reliable customer service. We want to bring this same value to WARDJet’s customers.” Due to innovative and specialized manufacturing capabilities and advancing technology, “people are excited about creating a new future together,” he adds. Both firms have become industry leaders by offering customized products tailored to the specific needs of the end user. WARDJet products will continue to be made in the USA at their Ohio facility and will now be supported by AXYZ’s global network of sales and support offices. Founder Richard Ward will retain the title of WARDJet president and says that he is looking forward to the next steps for the business he founded 23 years ago. The synergy between the two companies makes the WARDJet move to join AXYZ a logical one. For some potential clients a water jet cutting system may be the best option for the materials to be cut, while for others CNC router or knife technology is the preference. AXYZ was founded in 1991 and now has 13 owned-and-operated offices in the United States, Canada, United Kingdom, India and Poland, with plans to open additional offices. Like WARDJet, it sells and services end user customers without a middleman. Water jet technology “is very complimentary to what we are doing,” says Zeuner, who adds that the two company’s core values, built around maintaining promises made to customers and developing talented, loyal and long-term employees also made the acquisition ideal for both parties. The transaction allows AXYZ to retain “all of the existing infrastructure in both Ohio and Canada because the product lines are so different,” Ward reports. With close to 100 WARDJet employees joining the firm, AXYZ will now employ around 250 people globally. 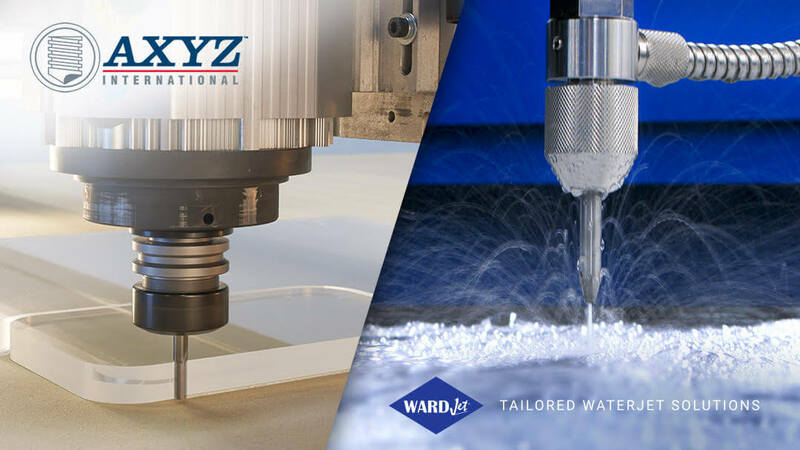 “We will have a much larger footprint in the [water jet] industry overnight,” says Ward, noting that the far-reaching network, as well as a strong chemistry with AXYZ, convinced him this was the best way to grow the company. “You have to embrace change to be on the right side of history, and this change is a natural one. WARDJet’s vision and our vision could not be more closely aligned,” adds Zeuner. To learn more about WARDJet visit their website.